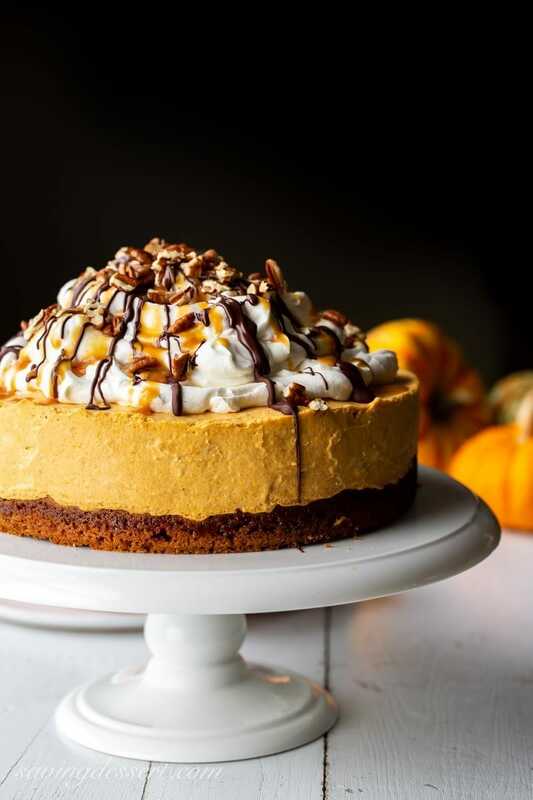 Change it up this year and thrill your holiday guests with this light and creamy Pumpkin Cheesecake with Turtle Topping. 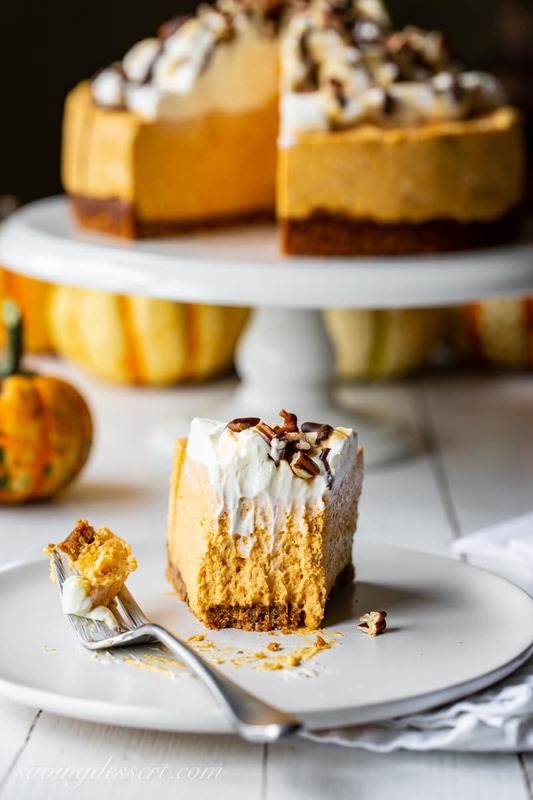 This Pumpkin Cheesecake may look decadent and rich, but it’s really light and fluffy and not too sweet. The easy no-bake filling is almost mousse-like and soft, but stable enough to be neatly sliced. The base is made from crushed gingersnap cookies providing nice contrast to the creamy filling. The gingersnap crust is the only component that is baked. I find a quick 8 minutes in the oven helps it hold together nicely without being crumbly. If you prefer a loose, more crumbly crust, skip the oven all together! Canned pumpkin puree is already cooked in the canning process so no need to bake this filling. As for the fun, luscious turtle candy inspired topping, it’s totally optional. However, the little bit of sweet caramel and semi-sweet chocolate really play well against the mousse-like filling. And, of course, toasted pecans are always a great idea! Turtle candy is a chocolate, caramel and nut confection first created in the early 1900’s. Whole pecan pieces create the illusion of a turtle’s head and legs with a large rounded shell made of caramel and chocolate. Turtles are very popular in the US and have long been fun inspiration for all kinds of baked goods. In this case, the light, not-too-sweet pumpkin filling is enhanced by the rich turtle decoration. In fact, it’s just the right amount of sweetness and really seals the deal for me! The whipped cream topping is combined with soft cream cheese so it’s very stable and easily supports the nuts, chocolate and caramel drizzles. Use a springform pan for this cheesecake so it’s easily removed for a pretty presentation. Line the bottom and sides of the springform pan with parchment paper for a clean, easy removal before serving. I don’t recommend using Cool Whip or plain whipped cream for the topping. I don’t think it will be thick enough to hold up under the caramel, nuts and chocolate drizzle. Cream cheese whipped cream is much more stable and will hold it’s shape for a day or two if kept well chilled. Feel free to use jarred caramel ice cream topping in place of melted caramels. Our local store has caramel candies in the bulk bin so I can buy just what I need. This recipe calls for 6 caramels. Chocolate sauce, like Hershey’s, won’t look as pretty as the magic-shell type chocolate drizzle pictured here. This chocolate mixture freezes in place and doesn’t continue dripping all the way down the sides like a syrup will. Don’t forget to lightly toast your pecans for wonderful flavor! 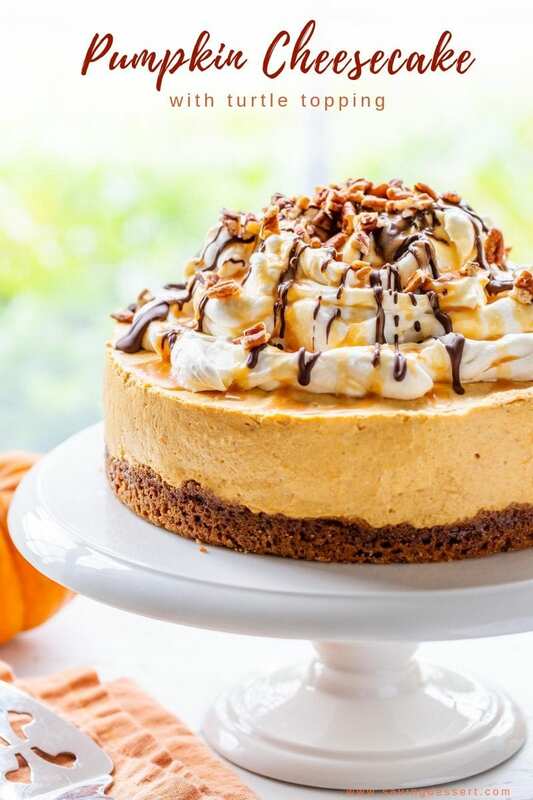 Once decorated, this Pumpkin Cheesecake will stay pretty for hours. It’s easily made ahead of time and refrigerated until served. If desired, decorate the cheesecake with the turtle toppings just before serving. 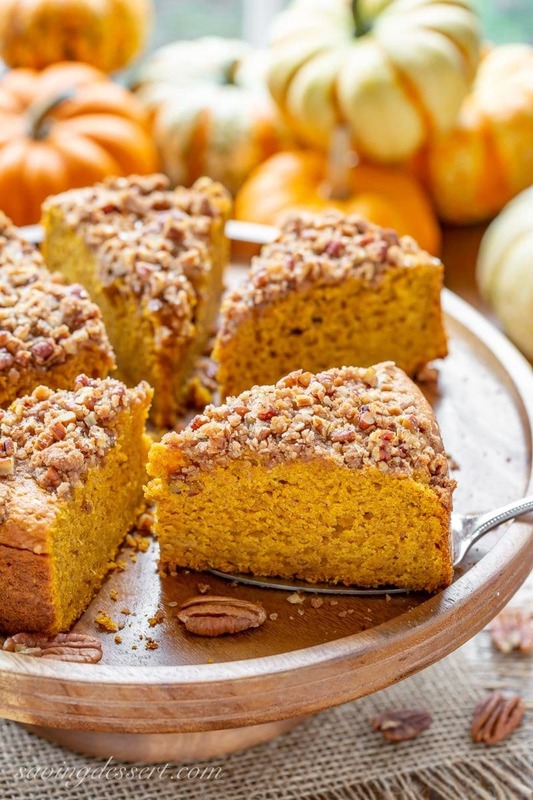 Pumpkin Breakfast Cake with Pecan Crumble – with a wonderful soft, moist crumb and a crunchy, sweet crumble top, you and your guests will remember this cake long after it disappears. Click HERE to get the Pumpkin Breakfast Cake recipe. Pumpkin Tart with Pecan Crumble ~ a surprisingly unique and delicious tart with a cream cheese pumpkin base and a sweet, crunchy crumble top loaded with toasted pecans. 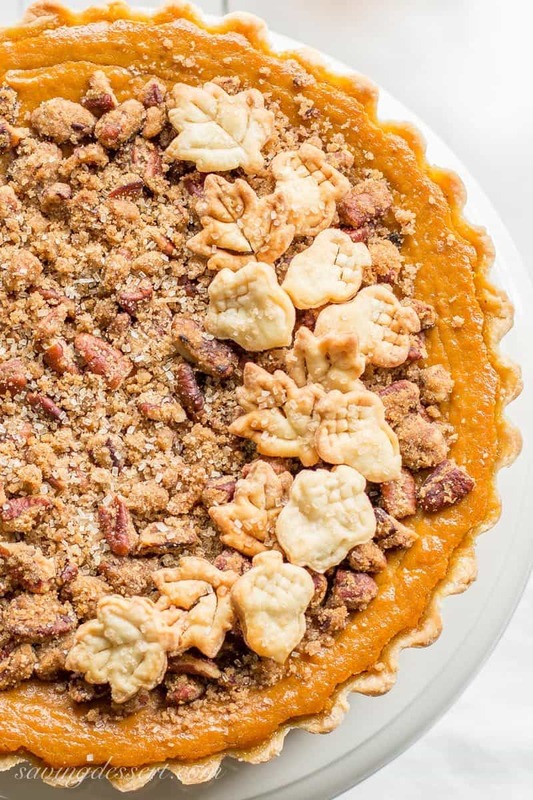 Click HERE to get the recipe for Pumpkin Tart with Pecan Crumble. Pumpkin Crinkle Cookies ~ soft and sweet, with plenty of pumpkin flavor and pumpkin pie spice, these easy to make cookies are the perfect fall bite! 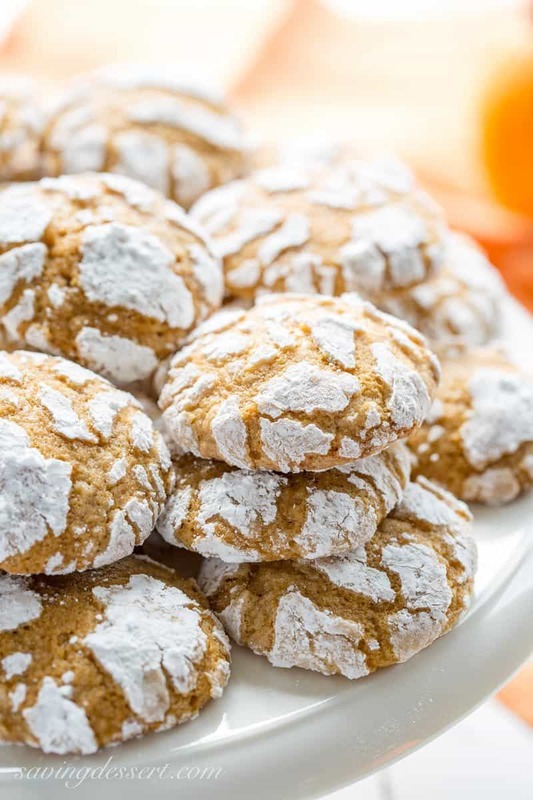 Click HERE to get the recipe for Pumpkin Crinkle Cookies. For this recipe I use an 8-inch springform pan. I love the nonstick finish and easy clean up, but most of all enjoy the spring latch offering a tight leak-proof seal. The pan comes in a variety of sizes ranging from 7, 8, 9 or 10 inch rounds. Click on the photo for more information. 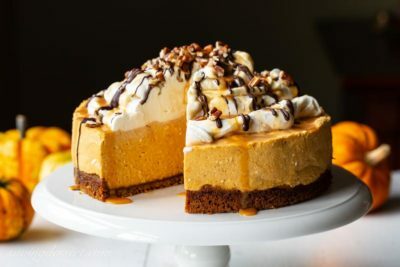 A terrific pumpkin dessert with a light and creamy no-bake filling over a ginger snap crust. Top with Whipped cream cheese and drizzle with caramel, chocolate and pecan. Preheat oven to 350F. Assemble an 8-inch or 9-inch springform pan, with the bottom turned upside down to make it easier to slide off the finished cheesecake. Cut a round of parchment to fit on the bottom of the pan. Cut a collar of parchment to fit all the way around the sides of the pan. This will help with easy removal of the cheesecake. In the bowl of a food processor, combine the gingersnap cookies, sugar and zest. Process until finely crushed. Add the melted butter and pulse until well mixed. Press the mixture into the bottom of the prepared pan. Bake for 8 minutes at 350F. Remove from the oven and cool completely before filling. 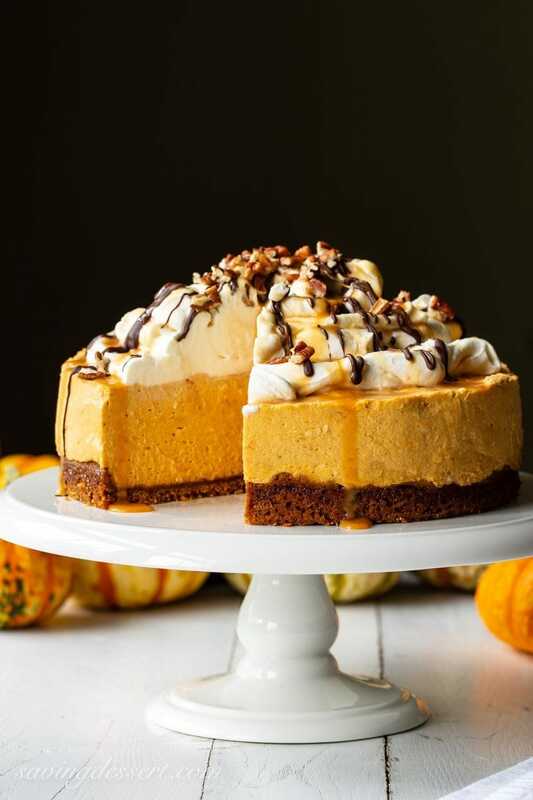 Once cooled, the crust can be refrigerated while preparing the pumpkin cheesecake filling. Place 1/4 cup of the heavy cream into a microwave safe measuring cup. Sprinkle the gelatin on top and whisk to combine. Let the gelatin rest for about 5 minutes, then microwave on high power for 20 to 30 seconds, or until cream is bubbling and the gelatin is completely dissolved. Stir and set aside. Pour the remaining 1 3/4 cups of heavy cream into a large mixing bowl. Beat (with whisk attachment) until the cream starts to thicken. With the mixer on low, gradually add 2/3 cup of granulated sugar. Beat on medium-high until soft peaks form, about 2-minutes. Cut the cream cheese into small pieces and scatter half over the beaten cream. Blend on medium-low until combined, about 1 minute. Add the remaining cream cheese pieces to the mixture and blend until smooth. Some small pieces of cream cheese may remain - this is okay. Add the pumpkin puree and beat on low until combined. Scrape the bottom and sides of the bowl with a rubber spatula. Beat one more minute on medium-high until the mixture is very smooth. Add the dissolved gelatin mixture and pumpkin pie spice and beat on medium-high until smooth, light and airy, about 2 minutes. Pour the filling into the prepared pan over the cooled cookie crust. Using an offset spatula dipped in hot water (then dried), spread the filling evenly. Refrigerate for at least 8 hours or for best results, refrigerate overnight. When ready to serve, prepare the topping. Combine the cream cheese, sugar and vanilla in a small bowl. Beat with an electric mixer for about 30 seconds. With the mixer running, slowly add the heavy cream and beat until stiff peaks form, about 2 minutes. Combine the unwrapped caramels and the milk in a small microwave safe bowl. Microwave the candy on medium power for 30 seconds. Remove and stir then repeat for 15 second intervals until all caramels are melted and the mixture is smooth. Cool slightly then drizzle over whipped topping. Combine the chocolate chips and shortening in a small microwave safe bowl. Microwave the chocolate on medium power for 30 seconds. Stir the mixture then repeat with 15 second intervals until the chocolate is smooth and melted. Cool slightly then drizzle the chocolate over the whipped topping. Wrap a hot, damp kitchen towel around the springform pan and hold it there for about 30 seconds. Unlock the pan and carefully remove the sides. Slide the cheesecake onto a serving platter and carefully remove the parchment paper from underneath, if desired. Dollop the topping in the center of the cheesecake drizzle with caramel and chocolate. Sprinkle with chopped pecans. Serve. For neat, clean slices, run a large thin knife under hot tap water and dry. Slice into 8-10 pieces cleaning and heating the knife between cuts. Make sure the cream cheese is at room temperature. Do not heat to rush the process. The cream cheese is best set out about 2 hours or more before making the filling. To make your own pumpkin pie spice mix together 2 teaspoons ground cinnamon, 1/4 teaspoon allspice and 1/4 teaspoon ground ginger. You’re the sweetest Susan. Thanks so much! Oh dear. This looks good. And I think I could make it! (I’m not a baker.) Thank you for the recipe! This is downright sinful, Tricia, and I’d like a slice of it right now! I like that it has a gingerbread crust, sounds perfect! And the turtle topping is icing on the cake! Woo hoo!!! Winner! Terrific looking recipe, and wonderful photos. This looks fantastic — thanks. This is a Masterpiece Tricia, how about entertaining the British Bake Off. I am not kidding, you would blow them away with this cake. You are too sweet Gerlinde. This is so easy anybody can make it for sure. My husband and I recently watched the BBO for the first time, what fun! This looks incredible, Tricia. I am literally drooling over those photos. Excellent work, Tricia. Wow! What a statement this one would make on a holiday table! And not to mention how delicious 🙂 Perfect! Thanks Jennifer – happy Canadian Thanksgiving! I love all of your pumpkin recipes, Tricia but this one looks over-the-top amazing! It would fun to surprise the family with this for Thanksgiving!